The benefits to premature infants of “Kangaroo Mother Care” can be profound: it can mean the difference between life and death for small and sick babies. Now a new study, conducted two decades after a group of Colombian parents were shown how to keep their perilously tiny babies warm, reassured and nourished through continuous skin-to-skin contact and breastfeeding, shows that as young adults those children continue to benefit in many major ways. 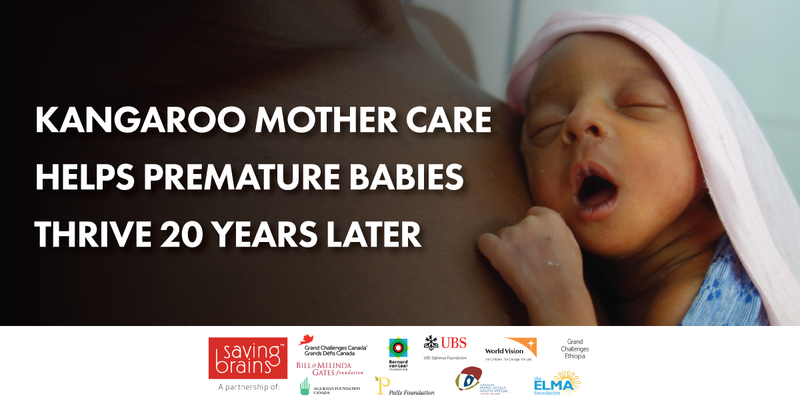 In short Kangaroo Mother Care can set off a cascade of positive events that allow these children to thrive. Led by the Kangaroo Foundation of Colombia and published in the journal Pediatrics, the Government of Canada supported the research through Grand Challenges Canada’s “Saving Brains” program, in association with Colombia’s Administrative Department of Science, Technology and Innovation (COLCIENCIAS). Most fundamentally, compared to premature and low birth weight contemporaries who received “traditional” inpatient incubator care, the research found that KMC offered significant protection against early death. Among survivors in both cohorts, however, the study found that KMC kids had larger brains — significantly larger volumes of total grey matter, cerebral cortex, and left caudate nucleus, which plays a vital role in how the brain learns, specifically related to the storing and processing of memories. And as young workers they earned substantially bigger paycheques — average hourly wages were almost 53 percent higher. Families trained in Kangaroo Mother Care were more likely to remain together and to be more protective and nurturing. These families were more likely to enroll their toddlers in preschool. As children, KMC kids were half as likely to have missed school days. Scores for aggressiveness and hyperactivity were 16% lower in the KMC group, particularly among children of less-educated mothers. Scores for externalization (the ability to express feelings, especially negative feelings, a trait associated with risk of juvenile delinquency, academic failure, and inadequate social adjustment), averaged 20% lower in the KMC group. The KMC parents also reported less antisocial behaviour by their children, compared to the reports of control group parents. These findings have important significance, given that about 15 million premature infants are born each year — one every two seconds. Preterm birth complications are the leading cause of death among children under 5, responsible for nearly 1 million deaths in 2015. Many survivors face a lifetime of disability, including learning disabilities and visual and hearing problems. Premature and low birth weight infants generally require extra care to avoid illness and death from secondary, preventable complications such as hypothermia and infection. This is a particular problem in developing countries, where incubators and similar technologies are often scarce, over-crowded or unreliable, as well as costly. A trained Kangaroo Mother Care parent or caregiver becomes a child’s incubator and its main source of food and stimulation. The technique involves continuous skin-to-skin contact between caregiver and infant, with the baby nested in a “kangaroo” position on the caregiver’s chest as soon as possible after birth. The technique is accompanied by exclusive breastfeeding. Kangaroo Mother Care also prepares the mother and child to go home as soon as possible from the hospital, after which there is rigorous monitoring of baby and mother until the infant reaches one year of corrected age (the baby’s age based on due date rather than date of birth). Family solidarity around the frail child is a key element in the success of the Kangaroo Mother Care technique. This knowledge, we believe, must be used to extend KMC coverage to the 18 million premature and low birth weight infants born each year who are candidates for the technique. This is a powerful, efficient, scientifically based health care intervention that can be used in all settings, from those with very restricted to unrestricted access to health care. It is universally affordable and can make all the difference in the world for premature and low birth weight infants. To learn more about Kangaroo Mother Care, visit www.fundacioncanguro.co. Dr. Nathalie Charpak is Director of the Kangaroo Foundation in Bogotá, Colombia. Dr. Karlee Silver is Vice President, Programs, at Grand Challenges Canada.